G-Power has lifted the M3’s guts to take the 1M Coupe into supercar territory. G-Power has been adding serious power to BMW automobiles since 1983. Now the mad engineers at the German tuning house have released a new aftermarket project that takes BMW&apos;s smallest car into veritable supercar territory. The latest project to roll off the line at G-Power&apos;s Autenzell headquarters is one fierce and powerful BMW 1M Coupe. The German tuning firm has replaced the coupe&apos;s 3.0-liter turbocharged straight-six with the E92 M3&apos;s 4.0-liter V8 to take things to the next level. And by the next level, we mean past 200 miles per hour. Called the G1 V8 Hurricane RS, the heavily-modified 1M Coupe boasts a whopping 600 horsepower and 428 pound-feet of torque, thanks primarily to an ASA supercharger, aluminum air box, stainless-steel exhaust and more to even further enhance the M3-sourced V8. Mated to a double-clutch gearbox, the engine swap allows the 1M Coupe to accelerate to 62 mph from rest in 3.3 seconds, to 124 mph in 12.7 seconds and, most impressively, reach a top speed of 205 mph. 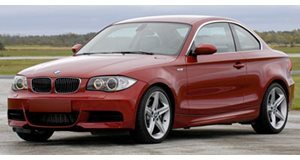 As a result, G-Power claims this is the fastest 1M Coupe in the world. In addition to the engine, G-Power also fitted the M3&apos;s axles to help the little coupe handle the power. Lightweight carbon-fiber hood and trunk, rear spoiler, KW suspension, new lightweight 20-inch alloy wheels wrapped in Michelin Pilot Super Sport tires and carbon-ceramic brakes to help handle all that added power. The interior of the 1M Coupe has also been upgraded significantly, using plenty of high-grade leather and Alcantara to wrap the new sports seats, rear seats, steering wheel and more. G-Power says that the G1 V8 Hurricane RS is the way the 1M Coupe should have come straight from the factory. We&apos;d have trouble arguing with them on that.